I hear the sounds of nature being called out from the alienation of modern life. Birds sing hymns of thanksgiving, flutes reverberate in the fields and musicians play percussive rhythms that awaken people’s spirits. The heat of the sun has been sufficient for the activities of the day and I see people rushing back home to enjoy social togetherness. I do not hesitate to dance, wiggle my body to the right and to the left. Indonesian primitive-style decorative painting and other artistic expressions are influenced by the terraced arrangement of public space inAsia. This is the case particularly in the fine arts of Java and Bali through the influence of Hindu-Buddhist culture and China. The decorative arts are characterized by arrangements on a flat screen and simplification of form, while symbolic elements abound as in the reliefs on the Prambanan and Borobudur temples on Java. The influence of primitive animism can still be discerned in Java in religious rituals and the spirituality of its art. The Javanese view of the unification of man and God is manifest in Wayang puppets, Keris dagger weapons, Kraton buildings and in batiks. Natural elements such as plants, the tropical animal world, human beings and objects together form a narrative of harmony. Many works of contemporary Indonesian artists explore these traditional themes and stylistic elements in new creations. The wealth of nature and spirituality underlie the harmony of my life. Hence they have become the foundation of my painting. I see painting as a means of meditation and catharsis from the repressive system of modern life, where materialism is increasingly colonizing humanity. I want to reflect the depth of Christian spirituality to express how God is present in nature and in the human body. I want to respond to God’s mandate to mankind to ‘fill the earth and subdue it; and have dominion over every living thing that moves upon the earth.’ I believe in the Christian faith being lived out in the context of a pluralistic culture. It is a challenge to live in the midst of many differences. I want to re-open eyes and ears to the uniting call of nature. I am thankful that warmed by the morning sun I receive the energy to welcome the gift of life. 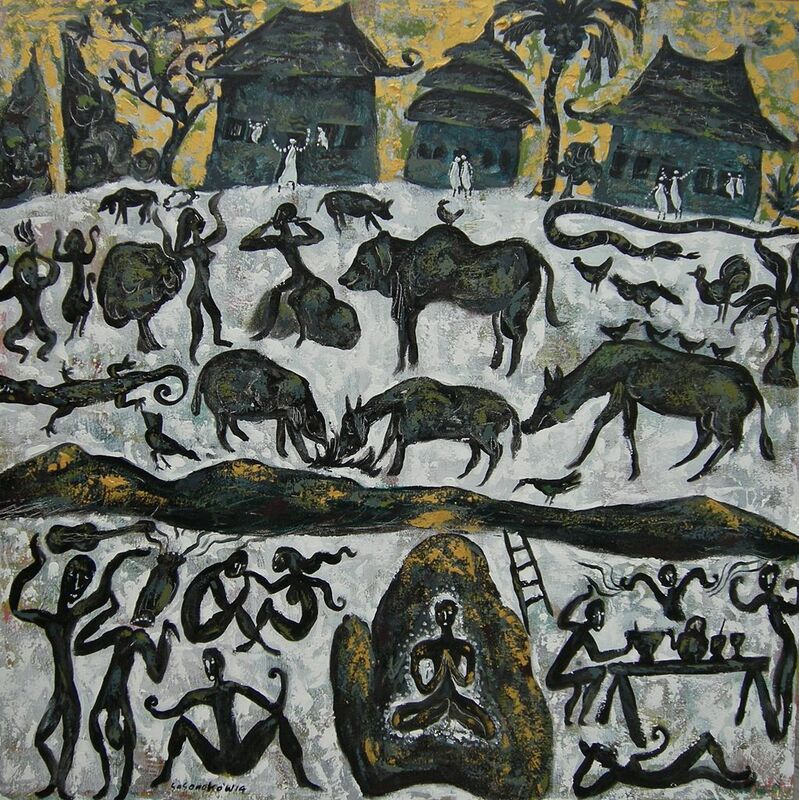 Wisnu Sasongko: The Song of Nature, 2014, acrylic on canvas, 80 x 80 cm. Wisnu Sasongko, born in 1975, began painting as an adolescent and then enrolled in the faculty of the Indonesian Institute of the Arts inYogyakarta, Indonesia, graduating in 2002. Unlike many Christian artists Sasongko does not depict traditional Christian iconography in the idioms or styles of his native country. His paintings and drawings are expressions of life as he experiences it and are often shaped by the religious conflicts taking place within Indonesia. His art functions within a framework of love and faith, but this does not prevent him from depicting harsh realities nor from offering cultural and political critique. His work has met with some opposition in his homeland and he freely admits that being a Christian and an artist in Indonesia is not easy. He also strives to express abstract theological concepts visually, as one can discern from the titles of his many works. Wisnu continues to be involved with the ACAA (Asian Christian Art Association) and to exhibit nationally and internationally. He was one of five artists chosen for the Summer of 2007 exhibition ‘The Christian Story: Five Asian Artists Today,’ held at the Museum of Biblical Art (MOBIA) in New York City.